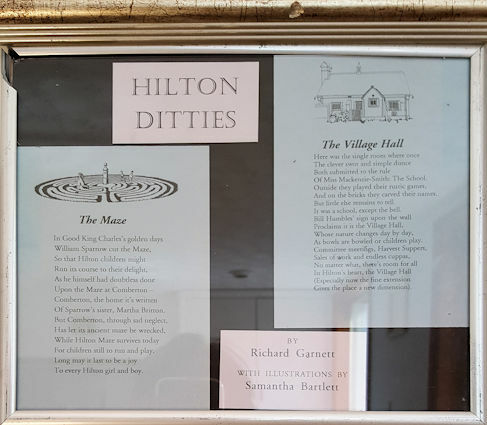 This little display hangs in one of the small side rooms in the Hilton Village Hall; we don’t know what year these poems were penned, but I love the sense they give of local village pride, and their commitment to keeping their heritage alive. We have visited Hilton enough times to have witnessed decades of family picnics and children at play on the maze to know for ourselves that it is enjoyed as much now as it ever has been. Of Sparrow’s sister, Martha Britton. For children still to run and play. To every Hilton girl and boy.